Revolutionary Approach to Deaf Education? Ken Carter who was a former Teacher/Lecturer of the Deaf, a parent of a deaf daughter, helped to set up Deafax, Deaf Aspirations, Specialkidz and just recently AVERIL(Academy for Virtual Education, Research & Inclusive Learning)intends to address this very unsatisfactory situation with the Department for Education and other bodies responsible. 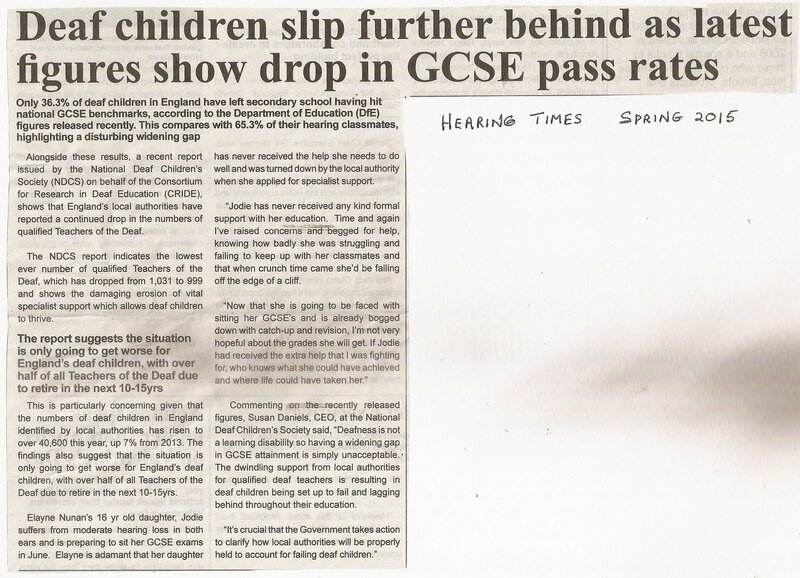 If this happens in England, how do other deaf children perform in the rest of the UK, Europe and worldwide? He, and other deaf and hearing colleagues, have spent a lot of time trying to raise the levels of literacy ,numeracy ,communication & academic performance of deaf children through their respective educational enterprises but these results show up the inadequacies of Deaf Schools, Hearing Support Units, Teachers of the Deaf, Parents and other organisations associated with Deaf Education in England. When one considers that the majority of deaf children spend only about 25% of their education actually at school and 75% away from school at home (weekends/holidays etc. )this situation needs a “revolutionary approach” probably through increased use of technologies, creativity and outstanding mentoring/tutoring/teaching in and out of the classroom. Exploring Home Access & Out of School Activity programmes are essential. If these DfE statistics are correct, a new approach to Deaf Education to raise standards for the 64% ,whom the system fails ,needs to be urgently implemented. Ken and his colleagues will be also promoting AVERIL (Academy for Virtual Education, Research & Inclusive Learning) which is soon becoming a company limited by guarantee/social enterprise as well as working with the Directors of Deaf Aspirations, Deafax and Specialkidz together with Professor Harold Johnson who is involved with www.deafed.net in the USA . Comments are very much welcomed from any of the readers….